Kart it up: The salute tells the story as Camden young gun Angus Wallace finishes first in the Gold Coast 600 Race of the Stars. Local kart racing young gun Angus Wallace has conquered the Gold Coast and has now set his eyes on Las Vegas. 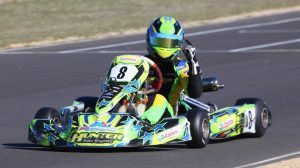 After finishing first in the recent Gold Coast 600 Race of Stars junior event, the 16 year old from Camden has been invited to race at the SKUSA (SuperKarts USA) Supernationals in Las Vegas. Although this is a huge opportunity, Wallace also sees it as a massive challenge. “The opportunity to race in the Rotax Pro Tour in Australia has given me some high level racing, but Las Vegas would definitely be the next level,’’ he says. Wallace, who employed all of his skills, fortitude and physical prowess to force his way onto the podium at the Gold Coast event, is a South West Sydney Academy of Sport (SWSAS) Future Stars program athlete. “I was really stoked with the way the weekend went – and qualifying eighth out of 31 was a good start,’’ said the young star. “The kart was in great shape and my focus was sharp,’’ he said. But behind every champion racing driver is a great crew and Wallace is no exception. His devoted dad Glenn and the crew worked really hard and things just got better – even when the rain came. Participating in sports such as elite kart racing is a massive logistical, financial and emotional challenge for all involved. That’s where the Academy comes in, helping deliver resources to dedicated and talented young sportspeople like Wallace. SWSAS provides athlete education on a broad range of topics from hydration to mentorship. It is superbly supported by local organisations such as Wests League Club, Campbelltown, which sponsors the academy’s Future Stars program athletes.